There seems to be a lot of judgment going around church circles lately. Or maybe I’m just more keenly aware of it than ever before. I know that Christians are often believed to be judgmental by those who are not Christians. However, I have never felt that way…until recently. I have always believed that Christians were more loving than judging and more accepting than condemning. Again, perhaps I have missed it or ignored it somehow. Or perhaps, with society’s enormous push towards “tolerance”, some Christians have felt the need to be even more vocal about what they believe to be so very wrong. I may get myself in trouble here. You may not agree with me – and that’s completely okay with me. However, I just don’t understand the need to be so very vocal about what everyone around you (especially those who are not Christ followers) might be doing wrong according to your viewpoint. I hate the word “tolerance”. I don’t understand the need for the word. I wish that people were kind enough and loving enough that the word “tolerance” wouldn’t have to be such a huge thing right now. I don’t want to just “tolerate” people! I want to learn to love them! In every situation, every family, every group – there will be people we don’t get along with and we have to learn to “get along” or “tolerate” each other for the sake of the bigger picture. Yes. True. However, a Christian is not meant to “tolerate” their neighbor – we are meant to love them! (Matthew 22:36-40; Mark 12:30-31). But SO often we are known for our intolerance rather than our love – intolerance to love – what a HUGE gap that is! What are we teaching our kids? To love only those who agree with us? To love them, but to make sure they know they are wrong? Is that really love at all? I don’t think it is. It breaks my heart to see so many groups of people treated so very poorly by the Christian community. Disclaimer: I know SO many Christians who are so very loving and accepting of all of those groups – so I know it’s probably more the exception than the rule. But isn’t it true that one bad apple spoils the whole bunch?! I don’t ever want to be that bad apple! No wonder people don’t feel welcome in the church when well-known pastors are tweeting about God’s judgment of people via the tornadoes, when there are churches like Westboro Baptist who judge and hate all men equally (unless they are exactly like them). Yes – it is our responsibility to speak truth….in love…at the appropriate time…and by the leading and direction of the Holy Spirit. I am a truth teller. I have a hard time keeping my mouth shut when I believe something “wrong” is happening. I understand the desire to set people right. I really do. I also understand that the purpose of truth telling HAS to be setting people right, helping people grow, loving them with our words and our purposes – NOT judging them or hurting them. Some things are not your business, pastor. Some things should NOT be said in public forums – or at all for that matter. What is the purpose of your words? To judge or to love? Conviction or compassion? To tear down or to build up? Ephesians 4:29 says, “Let no unwholesome talk come out of your mouth but only what is useful for building others up.” I have that one memorized. Not because I am awesome at it – but because I’m not. I have to pay very close attention to my words – every – single – day. Or I’ll slip. I’ll judge. I’ll show hate instead of love. I don’t ever want to be known for what I stand against – but rather what I stand for. Jesus stood for love. for peace. for acceptance. for grace. for truth. for mercy and kindness. Want to be more like Jesus? I do. I don’t want those around me to be reluctant to let me in for fear that I might judge them. Heck – I don’t want to be reluctant to let people in for fear that they may judge me! I want to be a true Christ “follower”. 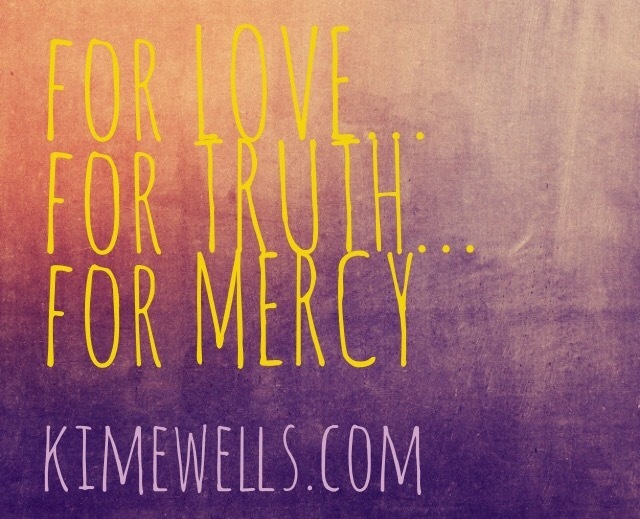 I want to stand for love….for truth…and for mercy!